The Cam is a multi-purpose, single-piece pocket tool crafted from heat-treated stainless steel. This powerhouse is perfect for bow maintenance on the hunt or at the range. Eight bit options and a broadhead wrench and sharpener means you'll have everything you need in one lightweight package. Clip it on and head out - you'll never be slowed down by not having the right tool again. The Cam is a multi-purpose, single-piece pocket tool crafted from heat-treated stainless steel. This powerhouse is perfect for bow maintenance on the hunt or at the range. Eight bit options and a broadhead wrench and sharpener means you&apos;ll have everything you need in one lightweight package. Clip it on and head out - you&apos;ll never be slowed down by not having the right tool again. 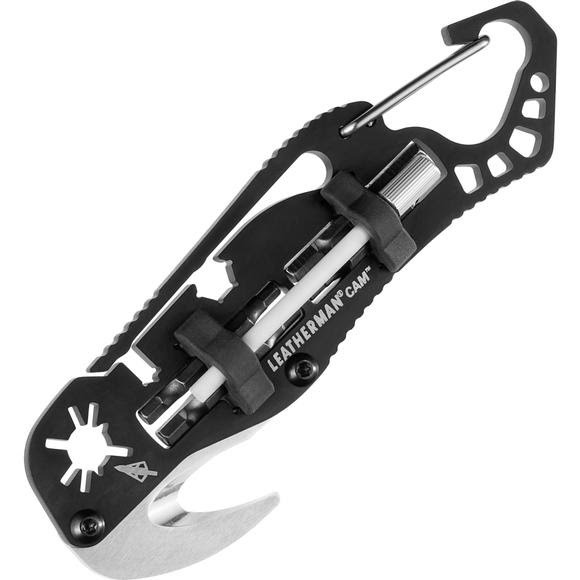 A high strength stainless steel used in many Leatherman multi-tools, often for handles. 420&apos;s higher chromium content makes this steel corrosion resistant. A hard, heat-resistant and corrosion-resistant material made by shaping and then firing a nonmetallic mineral at a high temperature.